One of my favorite shoes to this day is the Adidas Tempo 5. 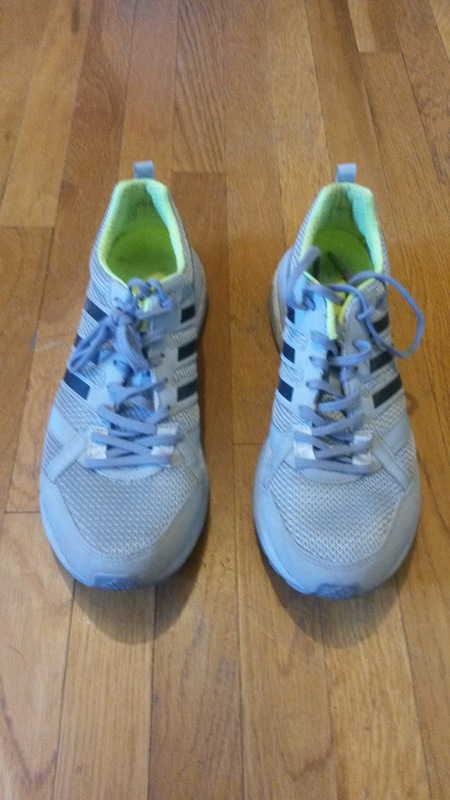 It was a lightweight stability shoe that fit like a racer but could be used for training. 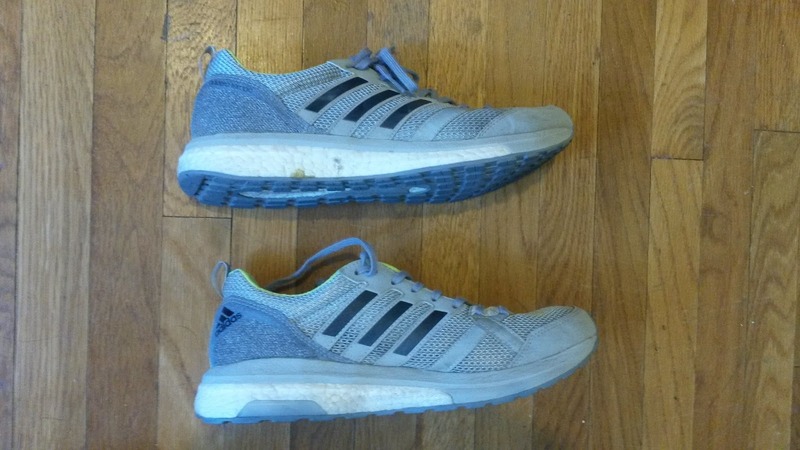 I got a pair several years late on ebay after realizing what I missed out on (again due to the minimalist craze) and ran them into the ground (570 miles! I do not suggest that...). Knowing that I decided to try the Adidas Tempo 7 (REVIEW) and found them to be a very different shoe. Much more narrow in the forefoot and not as firm. I skipped the Tempo 8 as I heard the forefoot was even more narrow. Then my curiosity got the better of me with version 9. 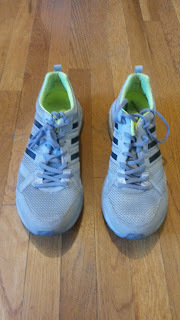 An Adidas Rep (who wished to remain unnamed) was nice enough to seed me a pair to see my thoughts. So here are my thoughts. 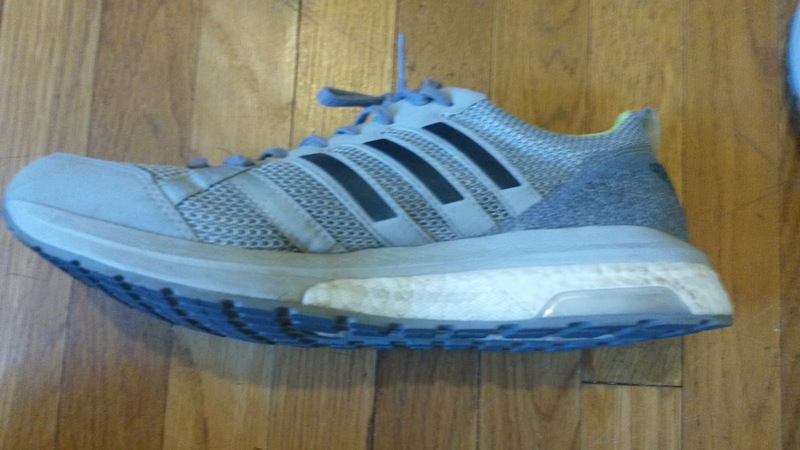 As with many editions of the Tempo Boost, the forefoot is on the narrow side. Version 9 is slightly wider than the previous two versions, but remains snug at first and slowly opens up with time. 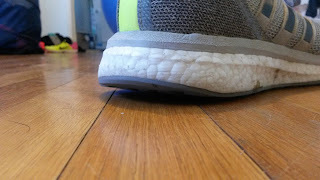 There continue to be thick overlays on the forefoot that I hope go away like the new editions on the Boston. These overlays can put additional pressure on the foot if you have a wider forefoot. The heel of the Tempo 9 is very secure. I was initially surprised that I did not need to perform a lace lock but did anyway. 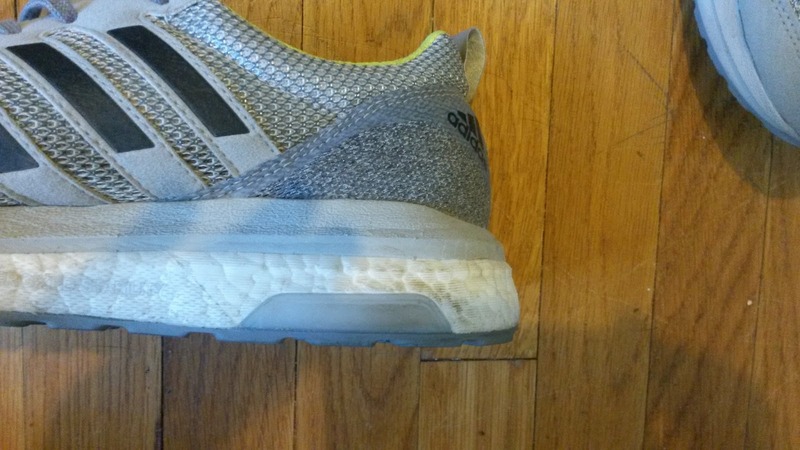 This comes from a stiff and substantial heel counter in the posterior section of the shoe that holds the heel well but those with sensitive Achilles tendons and insertions may need to be careful. 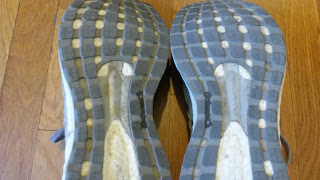 Continued thick overlays around the forefoot. Hoping these go the way of the newest Boston with the stretchy but secure mesh. The inner mesh is very comfortable against the foot. I personally did not wear this shoe sockless due to the overlays and thick heel counter. Instead I wore very thin socks and had no blisters or hot spots despite being on the narrow side. The thinner socks definitely helped me tolerate the lower volume fit much better. 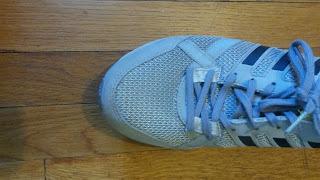 The three stripes do help hold the foot onto the platform as an extension of the laces. There is a large amount of toe spring still present in the Tempo 9. This does take some getting used to and I have discussed this aspect of shoes extensively (HERE). Those that are sensitive to this may have a hard time in this shoe, but for those who lack toe extension, this may be a perfect fit for you. 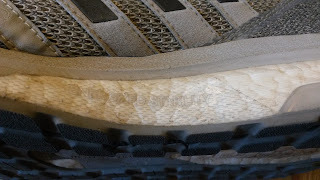 Full ground contact outsole makes the shoe more stable. There is a new design of the midfoot torsion system that appears to be a little more broad. A very stable forefoot is the most noticeable thing about this shoe. Adidas is now using dual density Boost which integrates very into the midsole. Those with neutral and mild pronation should both be able to enjoy this shoe. The "support" is very mild on the medial side but I feel it most from the midfoot foreward and less in the heel. In addition to what feels like a wider base than the previous versions (not confirmed), the dual density Boost addition adds a very mild support feature. Given Boost is already a bit unstable (being soft), do not expect a ton of motion control with this shoe. This is a faster shoe with a little guidance. A great deal of toe spring. Great for those who lack MTP extension. I feel like the Boost is firmer in this addition than previously. 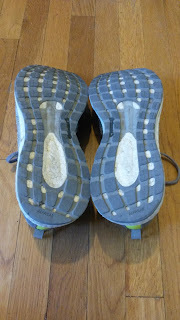 I do not have any data or specs on that, but that may partially be due to the dual density Boost in the mid/forefoot. Even in the rearfoot the ride is firmer (but not harsh). This is one of the many things that adds to a more stable ride without traditional stability. I think the Tempo 9 would work best as a lightweight trainer or even a marathon racer for those that need a little more shoe but want some speed. I have seen several people use this shoe for marathon races and I myself have used them for several fartleks and tempos (surprise). 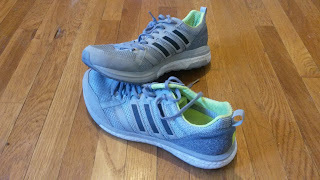 The firmer Boost responds well to speed and the snugger fit lends the shoe to feeling more like a racer. I personally would use a shoe like the Skechers Razor (HERE) for a marathon as it fits my foot better, but those with mild support needs and a narrow foot will feel very at home with the Tempo 9. While there is some minor posterior flare, the heel is beveled. The Adidas Tempo continues with a fairly durable Continental outsole. I am seeing very little wear after 50 miles and would expect to get full life out of these (300-500 miles depending on your biomechanics). The additional nubs provide much better traction on a variety of surfaces that previously. I have used these on trails without major slippage and have been presently surprised. The previously smooth outsole was not conducive to unstable terrain. The Tempo 9 can handle some off-road terrain well and I have been pleasantly surprised multiple times. Integrated Stability - Adidas is now using dual density Boost to provide stability. This is still in a way "posting" as there is a firmer "post" to fall into. It just happens to be integrated into the midsole. Posting is usually defined as an additional piece of durable material added to the shoe with the intent of altering foot mechanics. They are generally firmer than the rest of the shoe to create a contrast (the normal midsole moves more, the post moves less to alter the path of the foot... hopefully). 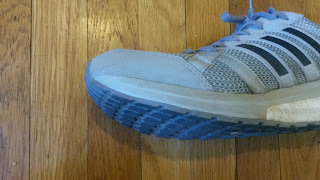 Several companies, such as New Balance with the Vongo, have forgone adding a completely new piece of foam and instead have been changing the durometer of the midsole progressively throughout the shoe. These shoes to me have felt much smoother and I have not felt that classic support "bump" that you sometimes have to get used to with traditional posts (optimally you should not feel that "bump" and it should fit right to your foot when looking for a shoe). So kudos to Adidas for trying this. This shoe is made for those with narrow feet who want a stable faster lightweight trainer. I would be biased to say that I would want a more anatomic fit up front since my feet are fairly average width (but sensitive). Make them run a bit wider up front would not hurt (and would reach a greater population of runners) but I definitely suggest keeping the rear section fit similar. Or Adidas, please remove those overlays from the forefoot and make it a mesh like the new Boston (which fits great). I know this is now an Adidas thing, but I would decrease that toe spring. I know I again am biased since I still have a great deal of toe extension (I am still young) but would rather see more forefoot flexibility and less toe spring. The Adidas Adios Boost 1 had very little toe spring but was fairly flexibility and is by far my favorite Adios shoe (other than the unboosted V2 because they look so good). While you do get used to it, it feels weird at first and as a DPT I would prefer you use that natural forefoot rocker as long as you have it. So for those with narrower feet and looking for a faster trainer or tougher marathon racer, I would highly suggest giving this shoe a look. It responds well when the pace picks up for workouts yet can handle long runs and even trail runs (not the primary purpose). While it is now a distant relative of the extremely fast Tempo 5 (which pretty much was the Adios with posting), it still has fast roots that will take you were you want to go. 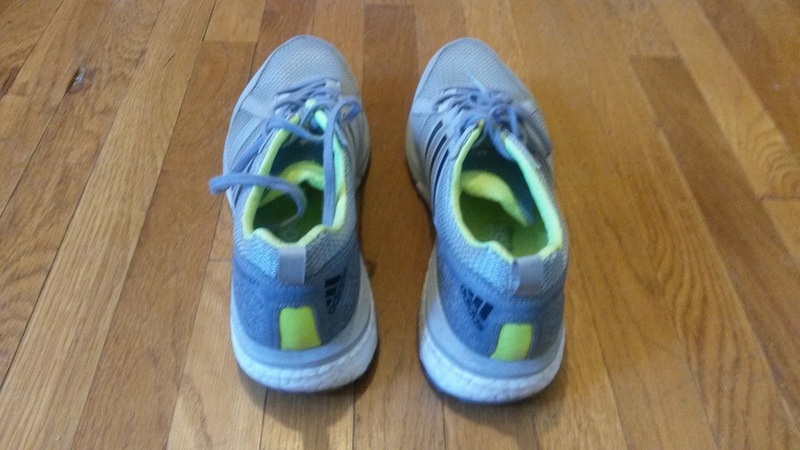 ***Disclaimer: These shoes were provided free of charge by Adidas in exchange for a review. This in no way changed or influenced the honesty of this review. I put at least 50-75 miles on trainers and 25 miles on racing flats. I currently have 50 miles on my pair and sent them to Dr. Kollias for further testing. That is the benefit of both of us having the same size (length only) foot (10.0 men's).